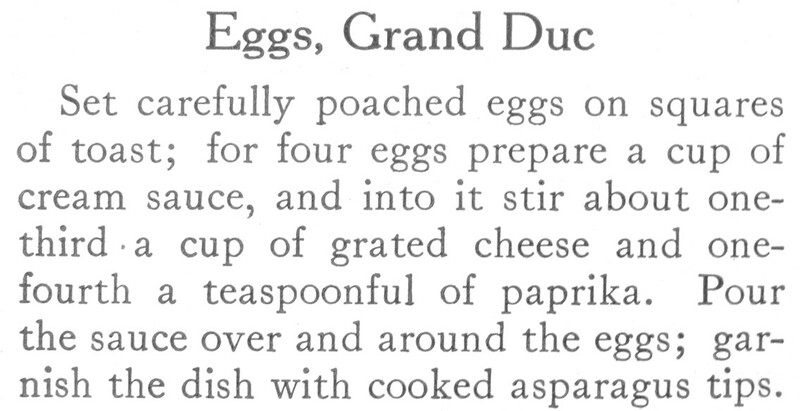 Asparagus and eggs pair beautifully, and hum of spring, so I was thrilled to come across a hundred-year-old recipe for Eggs, Grand Duc which is a delightful, surprisingly modern, egg and asparagus recipe. Toast is topped with long, graceful spears of asparagus, which is immersed in a creamy cheese sauce. And, it all is topped with a perfectly poached egg. The presentation is lovely, and would be perfect for a small Spring brunch. Here’s the recipe updated modern cooks. To make this dish more visually appealing, I used whole slices of toast instead of the toast squares called for in the original recipe. I also assembled the ingredients in a different order than called for in the original recipe. Bring 1 1/2 to 2 inches of water to a boil in a skillet, then reduce to a simmer. Break each egg into a small bowl or cup, then slip into the water. Cook for 5 minutes. 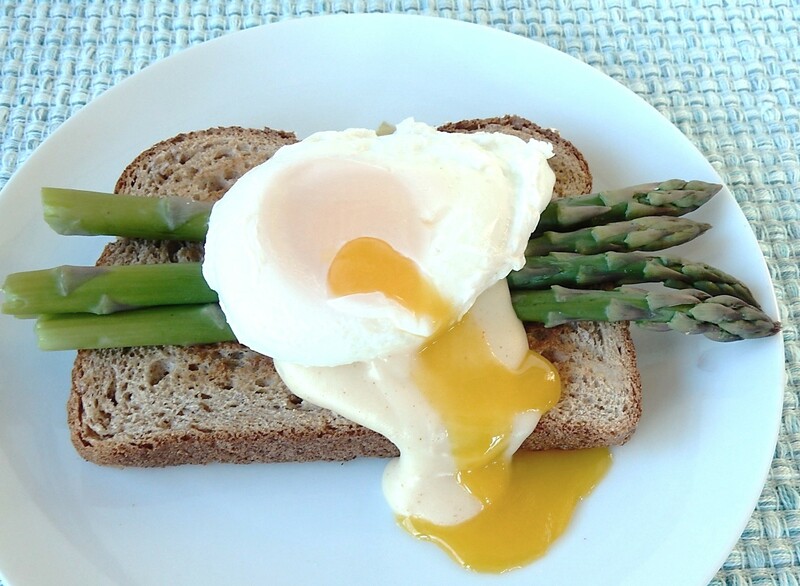 Remove the poached eggs from the water using a slotted spatula, and drain on paper towels. Using medium heat, melt butter in a saucepan; then stir in the flour and salt. Gradually add the milk while stirring constantly. Then add the cheese; continue stirring until the sauce thickens. On the top of each slice of toast, arrange one-fourth of the cooked asparagus. Spoon cheese sauce on top of the asparagus, and top with a poached egg. Posted on April 14, 2019 April 13, 2019 by SherylPosted in FoodTagged asparagus, eggs, recipes. I’m not the world’s biggest fan of asparagus but I think this looks yummy! It’s tasty. It’s nice to hear that you thought this recipe looked good even though you aren’t a big fan of asparagus. I’m hungry while reading this. The photo makes me even more hungry. This looks great. It’s my kind of yummy. Thanks. It’s delicious. I think that you’d enjoy this recipe. Now I’m thinking about the egg poacher I used to have. It disappeared somewhere along the way. I”ve never poached an egg without using a poacher, but it might be worth developing the skill — or buying a new poacher — to try this. I don’t find it difficult to make poached eggs without a poacher. You may want to give it a try, and see what you think. My mother had an egg poacher, but when I got married I didn’t have one. I decided to try making poached eggs without a poacher using the directions in the Betty Crocker cookbook. They turned out just fine and I’ve been making them ever since without a poacher. Thank you! It’s nice to hear that you liked with recipe. Wow, this looks good. I’m going to have to try it this spring. They’re yummy. I think that you’d enjoy this recipe. It is a beautiful presentation that would impress. Thanks for the kind words. It’s nice to hear that you liked the presentation. This sounds like a great way to serve eggs! Eggs can sometimes be boring. This recipe is a wonderful way to make them really special. I’ve never heard of this one. It sounds (and looks) delicious! It’s yummy. There are some wonderful hundred-year-old recipes, and I sometimes wonder why some recipes, like this one, are not commonly made today. Oh this looks good. If only Bill would eat cheese. I like the flavor of the cheese sauce, but I bet this recipe would also be good with just a white sauce. You’re welcome. I think that you’ll enjoy it. It’s a wonderful spring dish. This one is just in time for asparagus season! I love the old recipes using eggs with vegetables, and often they were hardboiled. They were so often grated and creamed and added to everything from mayonnaise to tomato sauces. You’re absolutely right. There are some wonderful old-time recipes that use hard boiled eggs and vegetables. Last year, I posted a hundred-year-old Scalloped Asparagus recipe which called for chopped hard-boiled eggs. Thank you for the kind words. I used whole wheat bread; but, now that you mention it, I think that rye bread would work really well with this recipe. Ok yum. Need hubby to poach the egg though haha. Thank you! It’s nice to hear that you liked the presentation. This dish is beautiful. I wish I were not the only one in my family who likes asparagus. I never explored the possibility of anyone else’s liking asparagus! I think that you’ll enjoy this recipe. It’s yummy. This does look delicious Sheryl. What a perfect combination of flavours. I agree- It’s a wonderful combination of flavors. A fancy name and it looks simply delish!! It’s fun how people a hundred years ago sometimes came up with very elegant international sounding names for dishes. This looks delicious! I can’t wait to try it out 😊 thanks for sharing! !